At Praxis, there is a constant push to be on the leading edge of innovation in primary and secondary packaging. One of the recent automation innovations to Praxis has been the addition of several Baxter “pick and place” robots from Rethink Robotics. These robots have allowed Praxis to automate many steps in the packaging process. This has helped production at Praxis become more efficient from the start of the packaging line to the end. Adding automation into the workplace is a honed skill. Praxis views Baxter robots not as substitutes for workers, but as compliments. In the packaging process, Praxis identifies the tasks that are repeated in every job – something that’s done everyday, regardless of the product. The simple, repeated tasks are the ones that Praxis finds easiest to automate. One of those steps is applying a stencil to a shipper. The image below shows one of Praxis’s Baxter robots applying a stencil to a finished shipper at the end of the line. Applying stencils to shippers is a process that is on every production line at Praxis – this allows Praxis to automate the stencil application on any line, on any given day. This additional automation allows the employee that was focused on packing the shipper, applying the stencil and stacking finished shippers on to a pallet, to simply focus on packing the shipper and stacking the pallet. Before adding Baxter to the line, the stencil application to the shipper was a time consuming, in-efficient process. Baxter allows Praxis to mechanize the process, eliminating wasted time and resources. 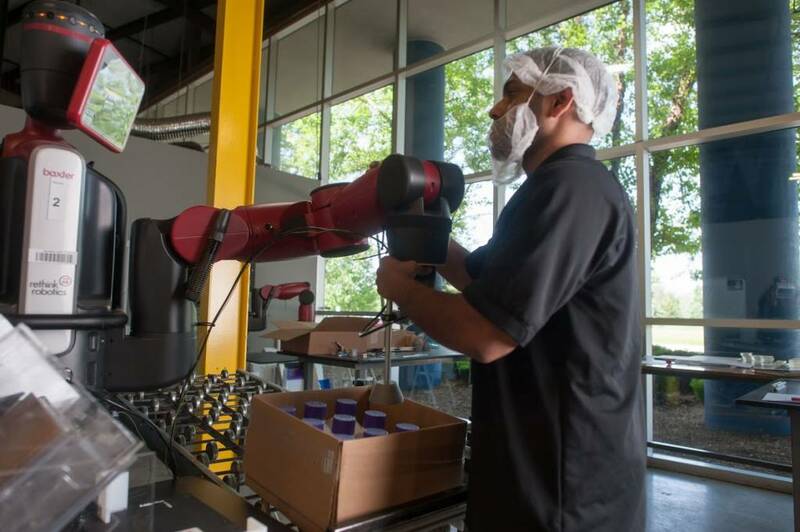 Praxis will continue the push toward automation in the near future with more Baxter robots on the way. Contact Praxis Packaging Solutions today to see how we can help you. See what other cool stuff we’re up to here.